Before jumping to surgery as an option for a muscle, tendon, or ligament injury, you should consider conservative treatment options we offer here at Alpha Chiropractic & Physical Therapy. Surgery can be hard on your body and, depending on your injury, the recovery time could last a while. With conservative treatment, it is easier on your body, you start seeing results right away, and you are not confined to a hospital bed for days or even weeks. One of the most popular conservative treatments is the Graston Technique. The Graston Technique is used to treat muscle, tendon, ligament, and soft tissue injuries. It speeds the healing and recovery time and is a well-known manual therapy approach which utilizes instruments and tools. These tools are specifically designed, stainless steel instruments with rounded, concave, and convex edges which are not sharp. They are used to detect and treat soft tissue fibrosis and chronic inflammation. 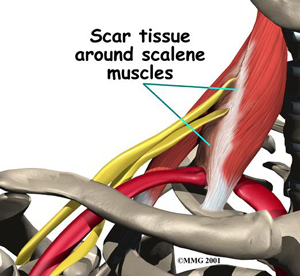 Scar tissue develops if injuries after a trauma to a muscle, tendon, ligament, or soft tissue has not healed properly. Since scar tissue is weaker than muscle and connective tissue, repetitive stress such as running, jumping, or lifting, can cause chronic soreness. When tissue in the body undergoes excessive stress and strain, it becomes scar tissue. It develops as a way to support tissue, but it is only a temporary patch up solution. When scar tissue goes through a second round of stress, it becomes aggravated and can flare up. This leads to more scar tissue being developed around the already-there scar tissue and this cycle goes on and on leading a large accumulation of scar tissue patches throughout the body. Even though scar tissue is the body's way of supporting the injury, more scar tissue developing will not heal the inside injury buried under layers and layers of scar tissue. The best conservative treatment option to break down scar tissue and heal the initial injury is the Graston Technique. Using the Graston Technique breaks apart the outer layers of scar tissue into several pieces. The stainless steel tools use force to pull the top fascial layer over the bottom layer, all the while breaking up the scar tissue pieces between the layers. Breaking up the scar tissue allows healing mechanisms to swarm toward the injured area and begin the repairing process of the muscles and soft tissues. The technique should not be performed aggressively in a way that causes you pain. You will feel a slight discomfort during the treatment, but it should be bearable. An aggressive Graston Technique can cause additional pain and can slow the repair process. For each region being treated by Graston Technique, the treatment will last for only a couple minutes. After treatment, swelling and redness can occur, especially after the first few treatments. 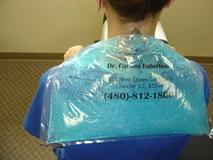 To reduce the swelling and the accompanying pain, it is highly recommended to ice after receiving the Graston Technique treatment. Besides the Graston Technique, other therapeutic treatments for addressing soft tissue injuries include massage therapy, manual therapy, trigger point therapy, or Active Release Technique. These treatments increase blood flow, decrease muscle spasms, enhance flexibility, speed healing, and promote proper tissue repair. When these treatments are incorporated and combined into a treatment plan, patients heal faster and are less likely to have long-term pain, soft tissue fibrosis, or scar tissue in the injured muscle. These soft tissue treatments are incorporated with therapeutic exercise and flexibility programs to enhance pain-free range of motion, to speed up recovery, and to increase the strength of the injured muscles. Icing after Graston Technique is very helpful at decreasing post treatment bruising, swelling, and pain. Since Graston Technique and any deep muscle therapy break up scar tissue in muscles, it causes inflammation which make the muscle tender to the touch. However, molecules within the inflammation after Graston Technique also help trigger the healing processes to repair the tissue properly. So we do need some inflammation, but too much makes you sore. We recommend you ice immediately after the treatment. The first few sessions with Graston we want you to ice in the office and then again within an hour. After several sessions you can use your judgment and discretion. If we work in a new area or work the muscle harder, then it is a good idea to ice extra for the next two days. Some people bruise easier than others, and those individuals should spend extra time icing. Ice is to be applied in 15 minute intervals. Apply the ice for 15 minutes and then remove it for 15 to allow the tissue to warm up. Repeat this process several times. Icing isn't the only at-home treatment you can do to decrease inflammation and pain. At home the first step is always PRICE: protect, rest, ice, compress, and elevate. Following PRICE will reduce the stress and after affects of the Graston treatment. Over the counter nonsteroidal anti inflammatory drugs (NSAIDs), as recommended by your doctor, can help reduce pain and inflammation, as well. Try icing and rest for as long as you can before reverting to drugs. Graston Technique is a tremendous treatment for relieve muscle and tendon pain, especially when combined with traditional physical therapy and chiropractic treatments. Click to learn more about Graston Technique.